Cabin Fever isn’t just the ailment felt this time of year, it’s the beautifully accurate description of the comic depiction of George Blevins’ life in desolate Fourth of July Canyon and nearby Gilpin County. Thankfully his comics have been saved and now compiled in “Cabin Fever Complete Volume One: 1983-1989,” with Vol. Two and Three to be released in the coming years. He will present a free cartooning workshop and singing books at the Cabin Fever Festival at the Gilpin Community Center, Feb. 21 from 1-4 p.m.
Blevins was brought to Nederland in 1981 at the age of 41 by his “now third ex-wife,” he said. “She was not enamored of the place, but she was not enamored of me either, so she left and I stayed here.” He had found a town he said was filled with a bunch of “odd balls,” and felt right at home. He purchased an old mining claim near the top of Fourth of July Canyon in an area known for steep hills and sweeping winds. Only accessed by campers and hikers in warmer months and a few brave backcountry skiers in winter, Blevins and three friends constructed a small shed equipped with a wood stove, but no running water or human neighbors for miles. “I just loved it there and wanted to live that kind of life. To see what it was like to be a mountain man, just go at it alone,” he said. Finding he didn’t have to work as hard now that his rent was $40 a year—the tax on the mining claim—he supplemented his living expenses working at the Bagel Bakery in Boulder. That is until he accidentally hit the “on” button while cleaning out a dough making machine. “I stuck my hand down there and heard something go thump, I came up and there it was, gone.” With the loss of the top of his right index finger , he found himself at home for a few weeks healing. It was this time off from work that Blevins started fulfilling a childhood dream of drawing a comic strip. He developed three rules for himself that he continued to follow over the years. Rule one: Draw in six panels. He figured it was easier to be funny than in the typical four panel comic strip. Rule Two: Anything can talk. Rule three: Don’t think about the ending until there, draw just one panel at a time. With these ideas, he approached Kay Turnbaugh, the publisher, at the time, of the Nederland Mountain-Ear newspaper. “Kay really knows journalism. Her mamma taught journalism and obviously taught it to her” Blevins said. He had been working for the paper drawing the editorial comic for about a year when Turnbaugh agreed to run his new strip. “It was so nice to work for a newspaper that was on the same ethical quality as the New York Times or any respectable newspaper. It kind of set the tone for how you viewed the town,” he said. Blevins describes many of his characters much like the residents of the area, “once they show up, they never really go away.” Cabin Fever began with three rules and three characters: The Man (George), The Dog and a radio. 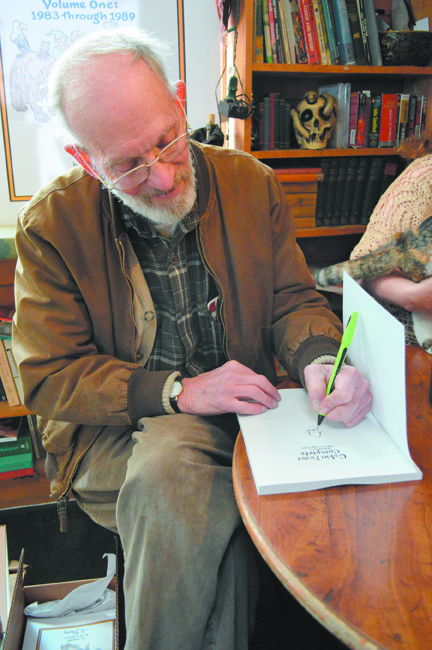 “I figured the radio was a good way to introduce politics and the state of the world and the dog was just, well, you had to talk to somebody,” Blevins said. At first, he thought he would stay with the original characters until The Hermit came along. Based on an old friend, The Hermit is described as well-educated, interesting, but very judgmental. “He was a hermit because nobody liked him,” Blevins said. “I was the only other person he hung out with, but he didn’t have quite the hermit-like tendencies for my taste; he showed up too often.” The unusual friendship provided Blevins much material as he unintentionally said things that made for a great strip. Blevins found inspiration by absorbing what was going on around him, but was cautious to not offend anyone. “I always felt like I was a cartoon character myself, writing cartoon characters for other cartoon characters. But I was real careful, since it was local. I knew these people, and even the ones I didn’t know, many of them knew me. That, and I’m not a big guy.” Since the rules of living up here haven’t changed, he figured everybody would always understand a joke about the wind. Anyone who has spent any time living in a mountain community can relate and feel connected to “Cabin Fever,” because as the world changes around us, mountain living seems to remain the same. Visit http://www.georgesefforts.com to learn more about the cartoonist. Blevins’ books can be found at Blue Owl Books, Nederland Visitors Center and Carousel of Happiness in Nederland. 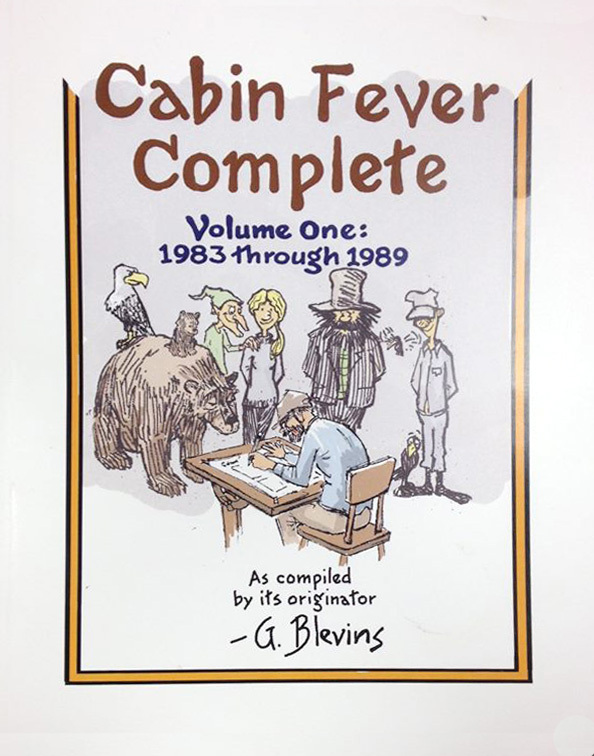 Tags: abin Fever Complete Volume One: 1983-1989, Cabin Fever, Cabin Fever Festival, George Blevins. Bookmark the permalink.